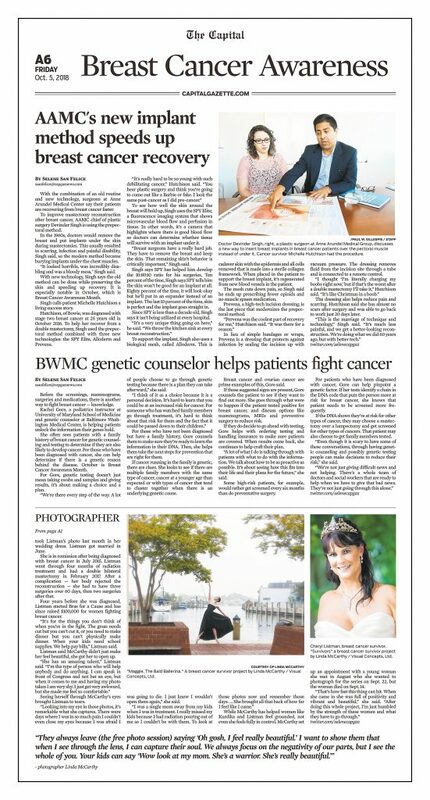 Last October, the Annapolis Capital Gazette featured Visual Concepts Photography’s breast cancer awareness project on its front page! We began breast cancer awareness project in 2016 when I met Maggie, the Bald Ballerina. At the age of 23, her doctors diagnose Maggie with metastatic breast cancer. 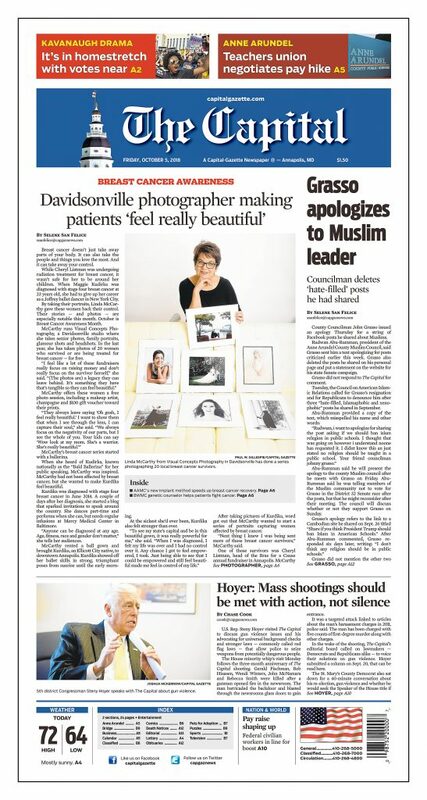 When I met Maggie and heard her compelling story, I decided to photograph her. Since that time, we have had several shoots together, and I have reached out to other survivors as well. My aim has always been to show these beautiful human beings exactly what I see in them: their strength, their tenacity, their beauty. This last October, Visual Concepts participated in a breast cancer awareness project art in conjunction with Corks for a Cause at Greenstreet Gardens in Lothian, MD, where we helped raise funds for AAMC. In the next phase of our breast cancer awareness project, we will be working with survivors to a book feature their stories along with their photographs. We hope their stories and images will uplift and encourage others who are experiencing the same journey. We need breast cancer survivor models to help us with this book project. Please click here for more information on how to sign up. If you join with us in this new breast cancer awareness project, you will find yourself looking and feeling beautiful as you are being photographed, and you will also help others like you on their journey. Why not make a date for yourself afterwards and celebrate — celebrate you, your life and your family! I’d love to participate! 2 time survivor. Please click on http://www.visualconceptsltd.com/contact and submit your information and I will reply to you. Thank you! I would so like to do this. I just diagnosed at the age of 38 and I am now 53. I just commented but it sent without my info. I was Diagnosed 2/2/18.. felt the lump myself and this started my process. Had double mastectomy with immediate diep flap reconstruction. Would love to share my story…. everyone should be aware and know options. Hello, I just found this email to me. I would still like to hear about the photo shoot and my survivor story being submitted. In June I will be celebrating 21 years of being a cancer survivor from Aggressive Stage III Breast Cancer. It is a miraculous and hope filled story!! Hi Cathy, Please e mail me at linda@visualconceptsltd.com and I will get in touch with you. Thanks! Me! I am a mom, speech therapist, and 8 year survivor!